2018 has been a tremendously rewarding year in terms of Marathi music and these awards have been known to celebrate the year’s music. Happiness and celebration had gone through the roof at the Havmor Ice Cream Mirchi Music Awards Marathi, which saw a melodious mix of fun, entertainment and zing! Being the only awards in the country to truly recognize the contribution of artists towards Marathi music, the awards night was a much-awaited event for the Marathi music lovers and was held at Ram Krishna More Auditorium in Pune! 2018 has been a tremendously rewarding year in terms of Marathi music and these awards have been known to celebrate the year’s music. A splendid evening hosted by even more splendid actors Swwapnil Joshi and Siddharth Jadhav, was a thoroughly entertaining one with their camaraderie in cheerful display! 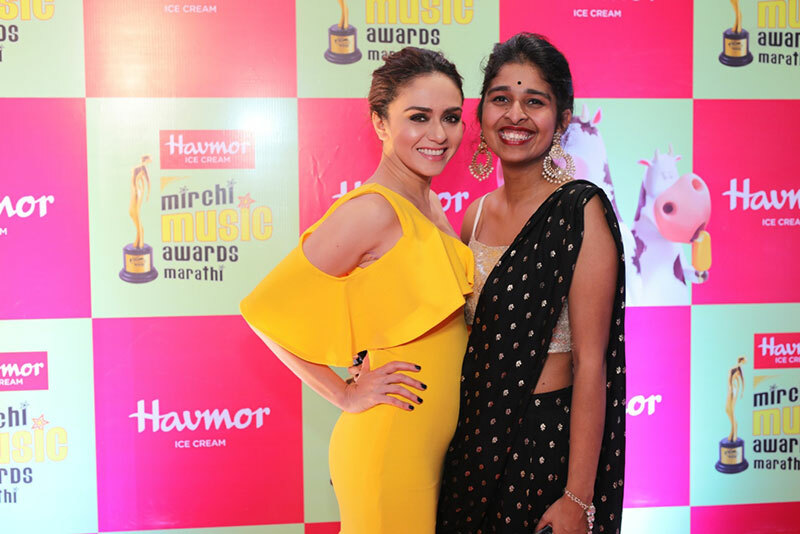 The awards night was quite a dazzling spectacle with the likes of Manasi Naik, Sonalee Kulkarni, SavaniRavindra, Parna Pethe, Deepti Devi, Mrunmayee Deshpande walking the red carpet and setting it ablaze! The venue resounded with the magical voice of Abhay Jodhpurkar as he sung his most popular songs! The audience was truly mesmerized and was left asking for more! Sudesh Bhosale too was seen entertaining the audience with his ringing voice! Brilliant singers like Savani Ravindra, Neha Rajpal, Hrishikesh Kamerkar and Anjali Marathe filled the air with their soulful voices and gifted the audience an evening to remember! The evening grandeur was multiplied with the performance of the ace singers of the Grand finale participants of Sur Nave Dhyas Nava! The evening went on to a musical crescendo with Jasraj Joshi belting out popular songs with his band! The stage reverberated with the footwork of the fabulous dancer and actor Sonalee Kulkarni! Her vivacious persona added a powerful punch to her performance! The chemistry was off the charts when Manasi Naik and Nakul Ghanekar delivered a sensational dance performance on the Mirchi Music Awards stage! Too many dancers definitely didn’t spoil the broth, with dance acts by Pushkar Jog and Bhargavi Chirmule too, gracing the stage with their effortless moves. The awards not only honored the best music of the year, but also acknowledged the musical giants of all times! Special awards were dedicated to these distinguished personalities. Avinash Oak gracefully received the Outstanding Contribution award for his illustrious career across Hindi and Marathi music. The Lifetime Achievement Award was bestowed upon one of the most revered person in the Marathi Music industry, Mr. Ravindra Sathe. Sachin Pilgaonkar, whose career spans almost 5 decades, was awarded with The Face of Iconic Hits Award for his contribution to Marathi music through his numerous memorable films! The 7th edition of the Mirchi Music Awards was an evening that had the audience enthralled! A perfect blend of glamour, star power and pure magic, the awards commemorated the best in all fields that make Marathi Music stand out! Entertainment Network India Limited (ENIL), popularly known as Radio Mirchi in India, owns 73 frequencies and is advertising partner for another 3, across 63 cities in India, making it India’s largest private FM radio broadcaster. Launched in 2001, Mirchi now operates across the country with 4 distinct brands – Mirchi, Mirchi Love, Kool &Ishq (for which it is the advertising partner of TV today network). With the highest radio listenership across the country (approximately 29 million people) and a track record of developing innovative content, Mirchi has been expanding and retaining its audiences and advertisers through the years. Mirchi has consistently delighted listeners and the industry with exciting properties such as Mirchi Music Awards (in 8 languages) & Mirchi Top 20. Mirchi is also the biggest concert player in India and organises more than 100 concerts every year. In 2018 itself, Mirchiorganised a five-city tour of legendary rockstar, Bryan Adams, and a two-city tour of the reigning world’s No. 1 DJ, Martin Garrix. Mirchi’s foray into the digital space has helped it gain a strong position with 21 online radio stations, the biggest radio website & biggest on Facebook, Twitter & YouTube. Mirchi also leverages in-house talent to produce shows which are put on its YouTube channels and various OTT platforms. Radio Mirchi reaches approximately 50 million people through its online content every month. Mirchi was also the first Indian radio brand to go international with the launch of the brand in the UAE. Mirchi also launched in Bahrain in March, 2018. On 26th January, 2019, Mirchi also launched in the US. The first brand to start ‘airport radio’ operations, Mirchi can also be heard at T3 international airport, New Delhi and Rajiv Gandhi International Airport, Hyderabad. With such a wide presence, on-air, on-ground & on digital, Mirchi is truly everywhere!